Joona Sheel is the Cambridge Assessment International Examination Coordinator. She coordinates grade K-8 and teaches IB courses in MYP and DP. She is passionate about nature and heads the bird club activities in school. She has a Masters of Philosophy in Zoology. The title of her thesis was “Effect of UV Radiation on the lenticular proteins”. She got distinction and was awarded a gold medal for the course. She did her Master and Bachelor of Sciences in Zoology from the University of Delhi and earned a scholarship for her M.Phil. She has written/presented papers at 16th Gujarat Convention, Ahmedabad Chapter; Indian Eye Research Group, L.V. Prasad Eye Research Institute, Hyderabad; Institute of Development Studies, University of Sussex, Brighton, UK. She was selected by British Council to lead a team of teachers to schools in Guildford and Trottiscliffe, West Malling in the United Kingdom. She also has an Honours Diploma in Systems Management. She has around 20 years of work experience in reputed educational institutes. 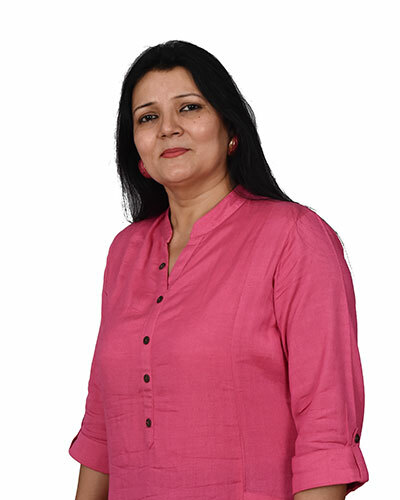 She started her career from Kulachi Hansraj Model School, Delhi as a Science teacher. She worked in Indian Institute of Management, Ahmedabad as Research Associate for a UNDP-GEF project- Management and Sustainable Development of Dryland Bio-diversity of North Gujarat. 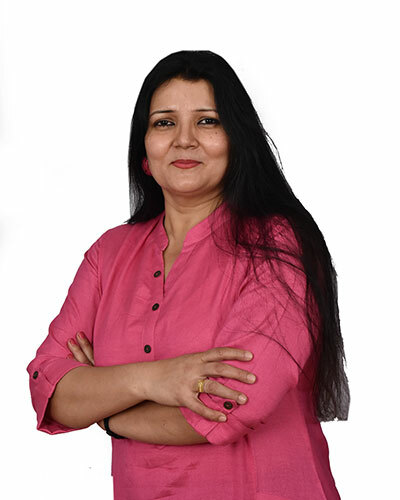 Later she joined IL&FS Education and Technology Services Ltd. as Senior Manager looking into content development, capacity building for teachers and students and implementation of PAN India educational mandates. Some of these include interventions with 463 Ahmedabad Municipal Corporation Schools, Rajeev Gandhi Charitable Trust at Amethi, 451 Tribal schools under the Tribal Development Department, Government of Gujarat, schools under Gujarat Secondary and Higher Education Board and several Non-Government Organisations. Landscaping– based on the changes the students wanted to see in school that appealed to the larger masses and were in alignment with safeguarding our environment. The project encompassed understanding of physical, chemical and biological world and their aesthetic appeal. Organizing a sports day for the school– the class organised annual sports event for the whole school thereby availing an excellent learning opportunities within and outside classroom through interactions with various stakeholders. They got a chance to hone their research, communication, management, negotiations and presentation skills and enhance various subject competencies.